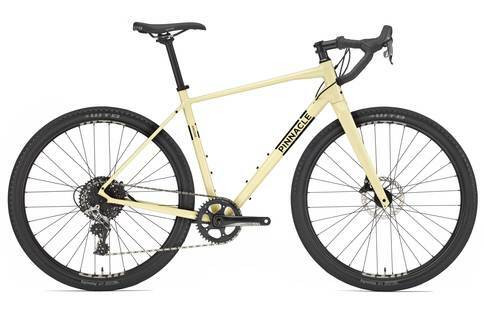 The Pinnacle Arkose is a production of Evans Cycles, and is marketed as being one of the best road and trail bikes out there. It is certainly a bike that looks stunning, and has the look of a racer crossed with an XC bike. The specs are wonderful, and are bound to keep you happy in the long run. One of the first things we noticed about the Pinnacle Arkose was the Shimano 105 gear shifter, with 22 speeds on it. This on its own felt like it beat out every single one of the other spec’d bikes in the same price bracket, including the Tiagra sets so many others have. When we factored in the gorgeous Shimano 785 Ultegra braking system with finned pads and a lockout, this bike took the cake. Overall, this is a bike that looks absolutely stunning…. on paper. When we took it out for the test rides, the reactions from our team were mixed. For some people, the hydraulic reservoirs on the brake levers put off the smoothness of the bike, although others said that the whole negative aspect was due to the way the Pinnacle tended to jolt like it was possessed when riding off-road. This wasn’t even on the rougher paths, but those with a few bumps every now and then. The Arkose is a bike that has been built to last as long as it is being ridden in its element. Take it off the roads and onto rural paths and dirt roads, though, and you may have problems. These aren’t huge problems, but they do stop the bike from receiving the best score that it could have. While it looks amazing on paper, the ride quality simply didn’t hold up to our expectations.